UtHC is delighted to welcome Beth from CookiePie as a guest blogger for this post. 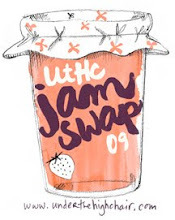 When Aimée wrote and asked me to guest-post on UtHC, of course I immediately said YES! Who wouldn't want a chance to visit one of the warmest, loveliest, and certainly tastiest blogs out there? Then panic set it -- What would I write about? What would I bake?? But of course, part of what makes UtHC a must-read is how welcoming it is, so that inspired me to submit these gingersnaps. 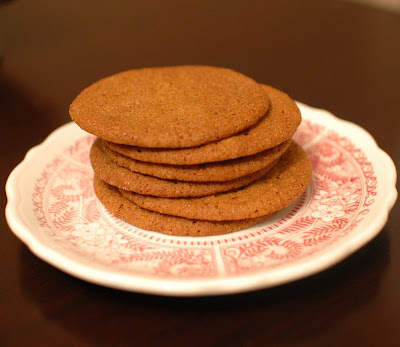 What could be better on a cold, rainy autumn day (as it is here in NYC) than freshly baked gingersnaps warming up the kitchen and filling the apartment with the wonderful aroma of delicious spices and molasses? My husband, Mark, came home while I had one batch in the oven and my hands covered in dough as I scooped the next batch into balls and rolled them in sugar, and said, "Man, it smells good in here!" That made me smile. I hope you'll try out these cookies on a day when you want to warm up your kitchen! I love them with a cup of tea or cocoa, but a glass of milk is always a good way to go (or some vanilla ice cream!). Enjoy! By the way - this recipe is from my new cookbook, "You Made That Dessert?". Recently Aimée was kind enough to participate in an online book tour in which she made another recipes from my book: Geraldine's Chocolate-Date Cake . Line three rimmed baking sheets with parchment paper. In a small bowl, mix the flour, baking soda, salt, ginger, cinnamon, cloves, and pepper, and stir with a fork to combine. Stop the mixer and add the flour mixture. Use a flexible spatula or wooden spoon to mix the dry ingredients into the butter mixture until a dough forms. Scrape down the sides and bottom of the bowl and stir well so that all of the dry ingredients are fully incorporated. Place the remaining 1/2 cup sugar in a small bowl. Use a small ice cream scoop or two teaspoons to scoop out pieces of dough and roll them, one at a time, in your palms to form balls that are about 1 1/2 inches wide. One at a time, roll the balls in the sugar until they're coated, then place the dough balls 2 inches apart on the baking sheets (don't crowd them-they will spread a lot). Use the bottom of a glass to lightly press the balls into discs. Bake the cookies for 10 to 11 minutes, until lightly browned. Let them cool on the pans on wire racks for 5 minutes, then use a spatula to remove the gingersnaps and place them directly on the wire racks to cool completely. 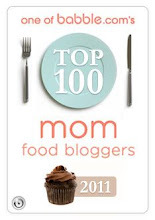 If you like the recipes you've seen so far, pick up the book at your local bookstore, or online. Yum, CookiePie! I love gingersnaps. And, nice to meet you! Mmmm, I love gingersnaps too! Thanks for the recipe which I can't wait to make. I love them when they have that sort-of, hot, hint of ginger. Almost peppery. I'll look forward to eating gingersnaps. Yeah, gingersnaps! I love them but have never tried making them. What a great recipe, I love ginger in cookies, it makes such a great taste! Thanks for sharing! Great post - these cookies look great. ooo...these gingersnaps are perfect for my dinner tomorrow night. Definitely trying these. I agree, CookiePie. I love the smell of gingersnaps, gingerbread, ginger anything. The entire house smells like the holidays! Crispy and then I have to dunk them in milk! Yumm! I love crispy crunchy gingersnaps! I haven't been in a baking mood lately...I'm sure that is all about to change with the holidays coming up! MMMMM,....these cookies sing to me! Just lovely enjoyed with a cup of ginger tea! and choose the best hanwcomdbags,high quality,free shipping,various styles.